Four delightful, family run, self-catering holiday cottages, near Truro, Cornwall. Welcome to St Anthony-in-Roseland Cottages. 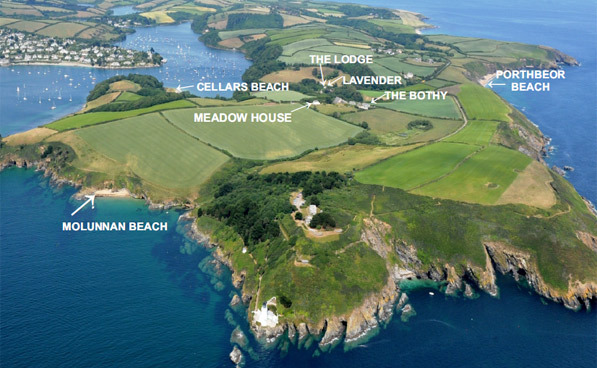 We are situated on the Place estate on the beautiful Roseland peninsular, just across the bay from the pretty village of St Mawes and down the lane from Portscatho. The cottages are surrounded by private and National Trust farmland and St Anthony-in-Roseland is designated an area of outstanding natural beauty and heritage coastline. As well as being a wonderful place for walking, which your dog will love, it is an ideal place from which to explore the rest of the county. The Eden Project is only 40 minutes away by car and the famous King Harry Ferry is a 20 minute drive away. We look forward to welcoming you, your children and your dogs to St Anthony, and yes, we really do like having children and well-behaved dogs to stay!
" If anything you have believed in has continued to be worth your faith, if anything you have wanted has not fallen below the expectation, you will realise my wonder when I saw St. Anthony...St Anthony-in-Roseland seemed lost, and happy to be lost, dreaming beside the sea..."
Meadow House is being given a makeover and generally refreshed, and will be available to rent in early spring from 9th March.